When it comes to decorating your table, you first need to decide on your overall wedding style. Look through magazines and websites to help you to get as much inspiration as you can before you decide. Be sure to remember that your wedding should reflect you and your partner, so don’t try to force a style that just simply doesn’t suit you. Whether it’s rustic, glamorous, simple, or bold, it is important to continue your theme throughout your wedding planning, and what better place to start than the all important tables! Achieving the right atmosphere is just as important as the cuisine, and the devil is in the detail when it comes to setting the perfect scene. Solid State UK are here to help you every step of the way. The foundation of any table setting is the linen, and 9 times out of 10 white is the best way to go. It provides a neutral, sleek backdrop for any of your additional decorations, and has a classic feel. With this being said, we have seen some stunning wedding tables with alternative table linen choices such as grey, beige or hessian. If you want to make a statement and stand out from the crowd, there are so many options for you to choose from. One of the best ways to express your wedding style is through table decor, and centrepiece possibilities are endless. Be classic, elegant and timeless with a vased floral showstopper and candelabras, or show your creative flair with tabletop lanterns, fairy lights, and bird cages filled with whimsical flowers and ivy leaves. A popular choice for a rustic wedding style is tree slices, stacked and staggered to create a platform of varying height for smaller decor choices such as mason jars, wooden crates, and shabby chic books. For winter or woodland weddings, think about bringing the outside to the inside with thick, green foliage, pine cones, and winter berries and casually lay these down. This works particularly well with trestle tables. 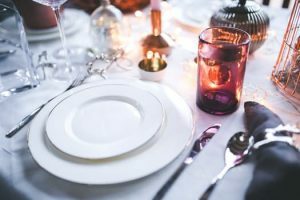 Of course, place settings need to be practical, so avoid large decorations that could restrict your guests personal space or make it difficult to eat and converse with ease. Settings are a great opportunity to enhance your wedding style; for example, at rustic weddings, slate or wooden place boards look great under a plate; for glamorous weddings, why not choose plates with a metallic rim for extra elegance? Regardless of your chosen theme, make sure that your glassware is plentiful to ensure you get lots of reflection from surrounding lights and candles. This will enhance your atmosphere and give your table setting a real sense of occasion. Don’t forget place cards to direct guests to their correct seats. These are also a lovely, quirky way of giving a gift to your guests, such as a bag of sweets with a name tag. This may not seem like an important detail, but the chairs your choose will really help to tie your theme together. For example, a rustic wedding may benefit from wooden chairs with a hessian sash, whereas a glamorous or minimal wedding would look great with full chair covers. Final touches to your table will really help to finish your decor. Candles, candles, and more candles can create an intimate, romantic setting and will compliment your glassware well. Napkins can either match your table linen, or contrast with it as an accent colour. A popular idea with guests is some form of entertainment on the table, such as a crossword or quiz based on the happy couple, or a disposable camera with a tick list of images to capture. It’s a great way to entertain your guests, but will also provide you with natural memories to go alongside your professional photos. Planning a wedding can be an overwhelming task, but we believe that you should enjoy every moment, which is why Solid State UK provide you with support every step of the way. Whatever wedding style, season, or size, our experienced team can talk you through your options and take care of the little details. If you would like to discuss options for your wedding day, call the Solid State UK team today on 0116 2885956. This entry was posted in News, SSUK Blog. Bookmark the permalink.